Union Station may not have the most original name—it&apos;s a generic term for a train station used by more than one railroad company or line—but of the hundreds of them in the U.S., it&apos;s the most beautiful. An Art Deco, Mission Revival-style gem, the station&apos;s centerpiece is a dramatic waiting room just begging your arrival in a trench coat as smoky sunlight beams through in lines meant for the movies. The chairs alone belong in a museum, and you won&apos;t find seating like that in any other major metropolis&apos;s depot. And the fonts? This example may be overused when discussing a certain type of lettering or shade of pastel, but they are perfectly archetypal of a Wes Anderson film. Some people may challenge L.A.&apos;s architecture, but the John and Donald Parkinson-designed Union Station is the greatest standing testament to to the city&apos;s edifices—and its ambitions. And unlike New York City, L.A. didn&apos;t demolish its great station, even when, in the 1950s, rail travel became less popular and Union Station fell from grace. The landmark building was added to the National Register of Historic Places in 1980, and has become the "Last of the Great Railway Stations," but it was not built without controversy. Meanwhile, the Los Angeles Examiner "used crude racial images in frightening the public out of voting for a union station &apos;between Chinatown and Little Mexico,&apos;” which spurred a bit of an editorial war between the papers. Los Angeles Mayor George E. Cryer came out in favor of the railroads, as their plan would provide a quicker solution to the congestion problem. And finally, the preservationists were concerned that the proposed Union Station location would wipe out part of L.A.&apos;s then-Chinatown. In some cases, personal stakes outweighed the city&apos;s best interests. With the support of the L.A. Times and the state railroad commission, the city council filed a suit demanding a single terminal in 1916, setting off a decade-long court battle whose final resolution would come not from a judge but rather the city&apos;s voters. In Scott L. Bottles’ Los Angeles And The Automobile: The Making Of The Modern City, he writes, "What began in 1916 as an attempt to improve the city’s railroad stations had evolved by 1926 into a major controversy over the nature of the city’s public-transit system. When the electorate finally voted down the railroads’ proposal, the city was left with the same problems it had before. Downtown traffic was increasing, streetcars and interurbans stall in the congestion, and the city lacked a plan for improving its public-transit facilities." In 1926, a measure was placed on the ballot giving Los Angeles voters the choice between the construction of a vast network of elevated railways or the construction of a much smaller Union Station to consolidate different railroad terminals. Two questions were put to vote in 1926. First, the voters approved Union Station instead of elevated railways by 61.3 to 38.7 percent margin. Second, the electorate voted in favor of the Los Angeles Plaza as the site of the new station but by a much smaller 51.1 to 48.9 percent margin. 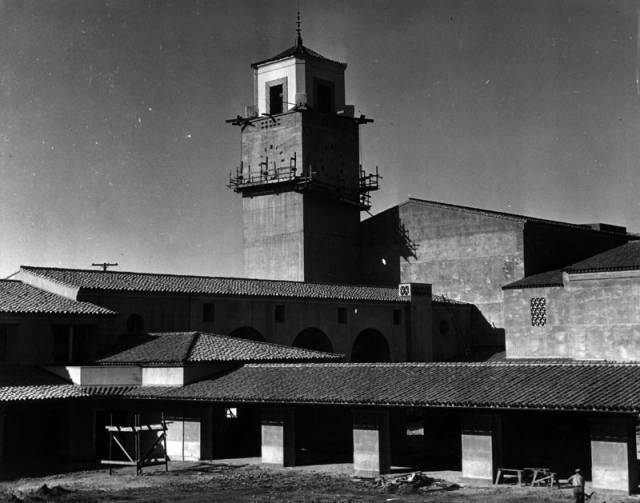 It still took another 13 years for the $11 million station to open, and when it did, it was at the cost of Los Angeles&apos; old Chinatown, most of which was razed in the early 1930s to make way for the station. The decision to displace the city&apos;s historic Chinese neighborhood (located several blocks to the southeast of Chinatown as we know it today) was controversial even then, but the so-called New Chinatown, which opened in 1938, thrived. The general location of the Plaza site plan was not random, however—Richard Sachse, chief engineer of the Union Station project, said at the time: "Probably the most important argument in favor of the Plaza site is the fact that it is adjacent to the future north and south subway." The Times reported as early as 1918 that a downtown Los Angeles subway was in the works to reduce traffic congestion. In his book, Bottles wrote, "When the electorate finally voted down the railroads’ proposal, the city was left with the same problems it had before. Downtown traffic was increasing, streetcars and interurbans stall in the congestion, and the city lacked a plan for improving its public-transit facilities…"
When I asked Matthew Barrett, a library administrator at LA Metro&apos;s Transportation Research Library and Archive, if the construction of Union Station essentially wiped out a major mass transit system in L.A., he argued that it did not: "Union Station’s design included both Los Angeles Railway streetcar and Pacific Electric’s interurban service turn around loops, flanking the right and left sides of Union Station so that railroad passengers could easily transfer to local rail transit services. 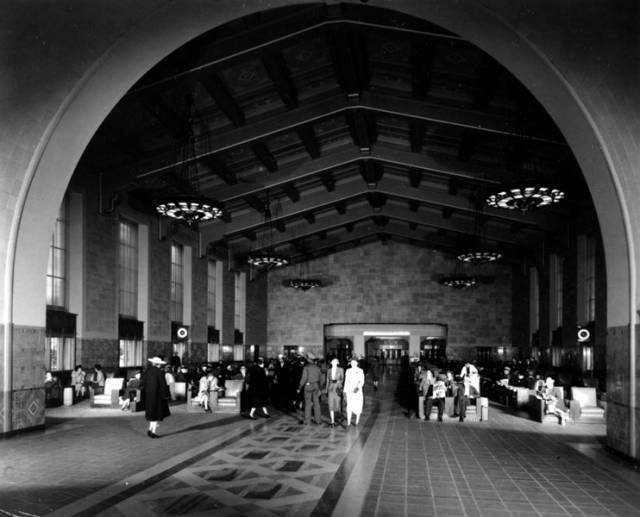 If anything, Union Station reaffirmed the commitment to rail-based public transit at the time of it opening in 1939. The 1926 elevated rail proposal appeared on the same ballot as a highway bond initiative. The public chose between bonding against tax revenues to help a wealthy private company (Pacific Electric and its parent Southern Pacific), or to build paved streets and highways the government would own as an asset. They chose the latter. Mass rail-based transit was killed by the construction of freeways and highways in the 1950s." Barrett confirmed that "there was also a lot of anti-elevated railway opposition from east coast transplants [who] had nothing nice to say about the elevated railways of the cities they left." In fact, some local papers sent reporters to the East Coast to gather negative comments about their elevated railways. When L.A. was quickly becoming a car city in the 1950s, and passenger trains lost popularity, the station became less important. Over time new life has been blown back into the station, and now, in 2016, more improvements are in store. A recent vision presented by Metro includes further developing the station with a civic plaza featuring outdoor seating—this area can be used for events and concerts; more seating inside; wider platforms; more retail space and restaurants. If they succeed, Union Station will once again be a destination not just for commuters.